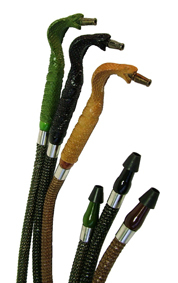 The King Cobra Hookah Hose by Vapor Hookahs is a seriously cool hookah hose that is made to resemble a snake the whole way through! The handle is shaped like a cobras head and the hose itself has a snake skin pattern all the way down! The end is even shaped like a snakes tail! 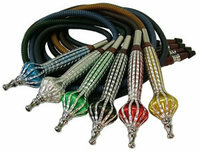 This unique, stylish hose comes in an assortment of colors to match most hookahs. It is washable and easy to maintain. 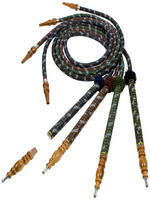 This Hookah Hose is compatible with the Narrow style Plastic Mouthpiece Insert only. Click Here to view our Plastic Mouthpiece selection. Disclaimer Please note that the Cobra Hose handle may vary in style than as pictured. Please contact customer support for further clarification if necessary.